Rutherford Lyle Key, Jr., 72, passed away peacefully on May 2, 2018. He was born in Birmingham, AL to the late Rutherford and Mary Alice Key. He graduated from The University of Tennessee and The University of Alabama School of Law. Lyle served as an officer in the United States Navy. He spent his entire career with CSX transportation, combining his passion for trains with his knowledge and expertise in transportation and the law. Lyle was a kind man who was loved by many and known for his love of trains and Big Orange Football. 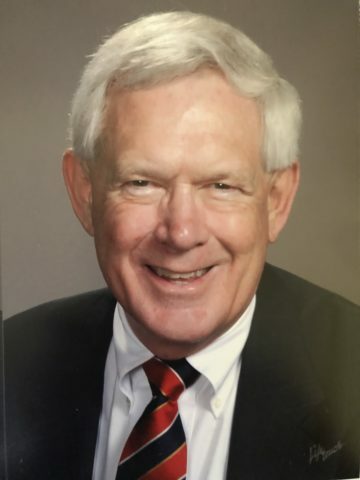 He served as President of the National Alumni Association for The University of Tennessee and also was a well known railroad historian and published two books, Midwest Florida Sunliners and Birmingham Rails. He is survived by his wife of 50 years, Carolyn; brother, Tom (Beverly) daughter, Alise Ferranti (Joe); son, Carson (Katie); Granddaughters, Lauren, Darden, Ellie, Maggie, and Annie and several nieces and nephews. The family will receive visitors from 4-6 on Thursday, May 3 at Harpeth Hills Funeral Home, 9090 Highway 100, Nashville TN 37221. A funeral Mass will be held Friday May 4 at 10 AM at St. Mary’s Catholic Church, 330 5th Ave N. Nashville TN 37219. There will be a graveside service at 2 PM Saturday May 5 at Elmwood Cemetery, 600 Martin Luther King Jr Dr, Birmingham AL 35211. In lieu of flowers, the family requests that donations be made to church or charity of choice. Arrangements made by Harpeth Hills Funeral Home. 10 Comments to Rutherford Lyle Key, Jr.
Dorothy and I extend our deepest sympathies on the passing of this special man. We will also be making a contribution in his name. Lyle was the epitome of a southern gentleman and a consummate railroad attorney, historian, and friend. Kelly and I will miss him, and send our deepest sympathies to Carolyn and their family. Dear Carolyn – I am shocked at Lyle’s passing. Had a chance to chat and catch up a bit with him at the RABO meeting recently and I was so looking forward to getting together with you folks. In addition to being a terrific friend and lawyer, Lyle was so good to my son Nathan when he was looking at colleges for football – and so supportive when Nathan chose Georgia Tech. He loved referring to Nathan as “The Iron Horse” as per the Atlanta J-C.
Lyle was a first class person. I was so surprised to hear of his passing. Lyle was a great guy and friend. We worked together many years ago when he was at CSX in trying to get Amtrak passenger service restored to Nashville. Carolyn, not sure if you remember Nancy and me from 1984 when you found our house for us when we moved to Jacksonville. Lyle was a great man and I was honored to call him my friend. I would send him articles from the Atlanta paper about Tom. He once said he would not know nearly as much about him if I did not keep him up to date on what was going on in his career. Please accept Nancy and My condolences and know that you and your family are in our thoughts and prayers. God Bless! Lyle and I began our friendship on a professional basis when he was in the Legal Dept and later the Regional Vice President for CSX and I with the Public Service Commission. Lyle was at all times professional, a gentleman and a strong advocate for the interests of CSX. Our mutual interest in railroading soon became apparent and we became great friends. Our friendship allowed us to workout issues that could otherwise become problematic. It didn’t hurt that we both had transportation degrees from UT. Lyle, my dear friend, you will be missed. Lyle and I met during a L&N/ICG railroad coordination project in the early 1980’s. I remember him as a true professional and gentleman in every sense of the word. My condolences over his passing. Carolyn, I do not know how to express my feelings, but please know that the Lord as well as Marlee, and I are with you in this trying time. I cannot begin to recount all the times that we were together throughout our careers, UT, and friendships, but we were blessed by those times. God bless Lyle and you. Carolyn, Carol and i are still in shock about Lyle’s passing. Lyle holds a special place in our hearts and memories and will be missed.